The best souvenir you can pick up while in Iceland is probably the Icelandic Wool Sweater, which is in Icelandic called Lopapeysa. Here you can find all about! Iceland is nicknamed the land of ice and fire. The fire represents the abundance of volcanoes and volcanic system tucked away in the colorful landscape. Here are the top 10 Iceland Volcanoes! Hákarl, Iceland's Fermented Shark or even the Rotten Shark is one of the weirdest things to eat in Iceland yet by some it is considered a delicacy. Find out all about it! Do Icelanders actually believe in elves, is it a publicity stunt or maybe just a myth? What do these mystical figures look like? Where do they live? Where can they be found? 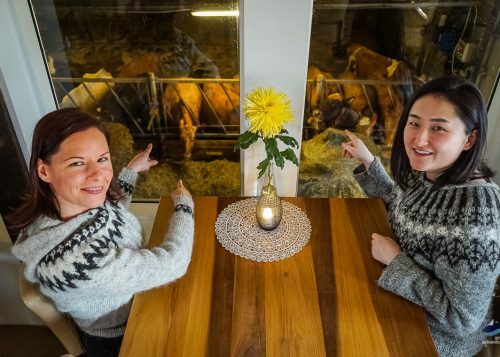 Here you will find out everything there is to know, straight from the source, an Icelander! Here is everything you might want to know about the Icelandic Flag. What is the history behind it? Who designed? Is it true there was once a fish on the Icelandic Flag? And fun facts! Wondering what to read before visiting Iceland? Why not dive headfirst into some Icelandic literature, where life in Iceland is covered from the Viking age to modern times. Some fiction, some crime, some true stories. Pick your poison(novel)! Where do Icelandic names come from? What are the most common names in Iceland? And, how do the last names work? Let's find out all of this and so much more in this Guide to Icelandic names! What is the most beautiful church in Reykjavík? To answer this question, here is a list of the top 10 most beautiful churches in the capital of Iceland! Skyr The Icelandic Yogurt | Everything you need to know and try! Skyr, the Icelandic Yogurt recipe that is rocking the world. Made by Vikings, kept Icelanders alive and is today the top choice for anyone looking to eat healthy. Find out all about it! All About the Icelandic Horse | What Makes it so Unique? The makes the Icelandic Viking horse unique? Is it its incredible soft gait, tölt? Or maybe its friendly demeanor? Is it that they grow up in open fields? Or that they have been purely bread since the Vikings brought them? Let's find out!